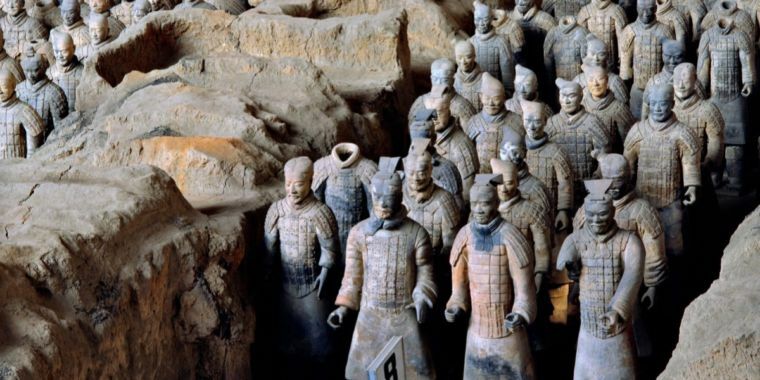 Ever since archaeologists excavated the first figures of the famous Terracotta Army of Xi'an in the 1970s, they have marveled at the pristine condition of bronze weapons accompanying the figures. Schools suggested that this was evidence of one of the earliest known anti-rust technologies, and over time, this hypothesis took on the veneer or fact, at least in popular accounts. But according to a new study in Nature: Scientific Reports it's the unique chemical composition of the surrounding soil that is responsible for the exceptional preservation. 0 BCE). Essentially a form of funerary art, these warrior figures meant to accompany the emperor to the afterlife. They once hero fully functional bronze weapons: spears, lances, swords, crossbows, and so forth. Over the decades, archaeologists have excavated tens of thousands of valuable weapon artifacts from the site, many of which were nearly pristine, even though handles, scabbards, and similar organic pieces had long since rotted away. Early tests showed traces of chromium on the bronze weapon surfaces, a metal element found in stainless steel that is resistant to tarnishing. Those traces suggested that the Qin artisans who made the weapons might have employed an early forerunner to the chromate conversion coatings invented in the 20th century, which are used for preservation today. Enlarge / Detail from the grip and blade of one of the Terracotta Army swords. The Terracotta Army and University College London, where Martinon-Torres worked before coming to Cambridge. There have been plenty of past analyzes of the metals, ceramics, soils, lacquers, and all the pigments used to make the figures and the accompanying artifacts, but they were largely confined to specialized disciplines. The collaboration brought all the pieces together so that knowledge could be integrated and used to develop a stronger hypothesis. The interdisciplinary team especially benefited from a plethora of new analytic techniques that are faster, non-destructive, and most importantly, portable. "So we don't have to remove samples from the objects, and we can bring the laboratory to the archaeological site rather than the reverse," Martinón-Torres said. "The vast majority of these analyzes were done in situ at the museum without compromising the integrity of these artifacts." 450 metal weapons, along with samples of terracotta warriors, soil, and lacquer. So they were able to spot patterns of where chromium could be found and where it was absent that would not have been readily apparent to researchers in the past. The results: there was no correlation between the amount of chromium found on a weapon's surface and its state of preservation. In fact, some of the best-preserved didn't show traces of any chromium at all. Instead, the chromium previously found on the bronze surfaces of the weapons was probably contamination from the lacquer used on other objects at the site as a pre-treatment prior to painting them with pigments: namely, the terracotta warriors and all the organic elements of their weapons (lance shafts and sword grips, for instance, which were made of wood). High levels of chromium were found in the lacquer they tested, but only trace amounts in nearby pigments and soil — evidence of possible contamination. Enlarge / Backscattered electron image and X-ray maps from a cross-section of a scabbard fitting. There are higher concentrations of chromium toward the inner surface, which is more oxidized and has more tin and lead. So what is the secret to these ancient bronze weapons looking so good for their advanced age? 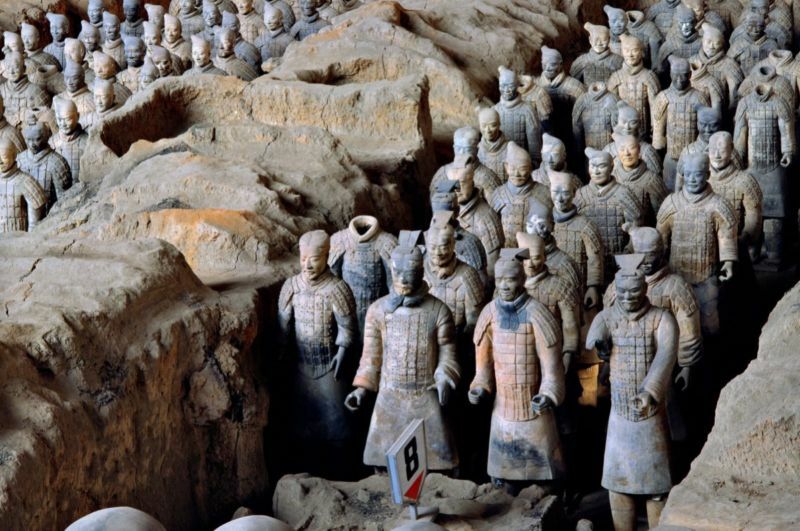 It's probably due to the surrounding Xi'an soil in which the Terracotta army was buried for 2,000 years, which has a moderately alkaline pH, small particle size, and a low organic content. The researchers used and environmental chamber to simulate the weathering process, subjecting replica bronzes to extreme temperatures and humidity. Those bronzes buried in the soil were still priced after four months; Those buried in typical British soil showed severe corrosion. The well-preserved weapons also showed higher levels of tin in the bronze, which may also have contributed to their remarkable preservation. There is still at least one remaining question: how did the chromium get into the lacquer in the first place? That's a question that requires further investigation, according to Martinón-Torres, although he has a working hypothesis. The lacquer is basically the juice of a particular tree that becomes solid and waterproof as it cures. Qin artisans often mixed in various minerals to facilitate the curing, speeding up the hardening of the juice. "So it is possible, but by no means proven, that Qin artisans mixed some chromium-bearing salt with the lacquer in order to facilitate the curing, "he said. While the unique soil and the high levels of tin in the bronze weapons help explain the unusually well-preserved artifacts, the team doesn't rule out the possibility that Qin artisans had some technological secrets that also contributed. "In archeology, we often say the absence of evidence cannot be taken as evidence of absence," said Martinón-Torres. "All we can claim at the moment is that we have no evidence for any arcane technology used to help with preservation. That doesn't mean it wasn't there, we just have no evidence of it currently." Scientific Reports 2019. 10.1038 / s41598-019-40613-7 (About DOIs).